In this particular blog we will talk about a very useful and important part of Java language i.e. Collection framework. Collection framework provides interfaces and class implementations that enable data handling easy and meaningful. Using collections one can store, retrieve and manipulate the data very effectively and easily. Before we start lets first discuss the Architecture of Collection framework and hierarchy of Classes and Interfaces. 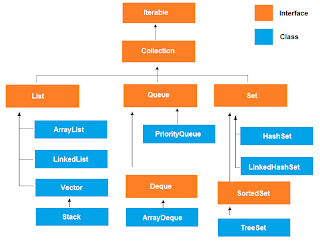 The Collection Interface resides at the top of the Hierarchy, although Java does not provides a direct implementation of Collection framework but Collection Interface is being implemented by List and Set Classes. A set is a Interface that does not contain duplicate values. In provides three general purpose implementations in Java. HashSet is the best performing implementation of Set interface. It stores its elements in a HashTable an does not guarantee of any type of ordering in iteration. TreeSet is a little slow than HashSet and it stores its elements in a red-black tree structure. TreeSet orders its elements on the basis of their values. LinkedHashSet is implemented as a HashTable with a LinkedList running through it. It orders its elements on the basis of order in which they were inserted in the set. A List is a ordered collection that can contain duplicate values. It provides three general purpose implementations. ArrayList is said to be the best performing list implementation in normal conditions. In simple words we can say that ArrayList is a expendable array of values or objects. Linked list is a bit slower than ArrayList but it performs better in certain conditions. Vector is also a growable array of objects, but unlike ArrayList Vector is thread safe in nature. A Queue interface provides implementation to hold elements prior to their processing. A Deque interface also known as double-queue provides insertion and deletion of elements from both end points. A Map interface provides key-value pairs, map objects contains keys associated with an value. Maps can not contain duplicate keys and one key can be mapped to atmost one element. In Java Map interface provides three general purpose implementations. A HashMap is a HashTable implementation of Map interface, unlike HashTable it contains null keys and values. HashMap does not guarantees that the order of the objects will remain same over the time. A TreeMap provides red-black tree based implementation of Map interface. It is HashTable and LinkedList implementation of Map interface. LinkedHashMap has a double-linkedList running through all its elements. Here we are done with a brief introduction to Java Collection Framework, in today's discussion we covers List, Set and Map Interfaces and their implementations. In upcoming blogs we will see more about HashSet, ArrayList and HashMap collections and a detailed implementation of these classes and interfaces.